I bought some used Marklin track at a good price but many of the track sections were slightly corroded. I cleaned each section with alcohol, which removed some of the discoloration, but compared to new track there is a huge difference. I keep a pack of 2000 grit automotive sandpaper in my toolbox, leaves a very smooth finish even under magnification. Follow this up with a good alcohol swabbing and it's helped me more than once. Removes gunk in a hurry, you might give this a try. Without knowing the reason for oxidation (smoking, chemical overspray, etc.) you may have to abrasively clean it. Sources for superfine abrasives like John suggested are at you local Target, Wallgreen/CVS or Beauty supply store. They are called Nail Polisher boards. They come in single or multi-grit, 1000-4000 and differing widths. I perfer the 1/2 wide 3" long ones. After you are done, the track will immediately start to re-oxidize (atomically). This is why, in the past and into today, we have used Wahl Clipper oil (and the like) or ideally a real purposed product like No-Ox. This thick dark grease is wiped on clean rail - super thin film - and left on for a while, then wiped off before running trains. It reacts with the clean rail to eliminate further oxidation. You should never need to clean the track again. Just dust wipe/vacuum. You won't need alcohol or else to clean it. And no grit abrasives either, or you have to re-apply the No-Ox. www.amazon.com/NO-OX-ID-Tube-Special-Grease-Compound/dp/B00HSW341A or search for: no-ox-id. Thanks, guys, I appreciate the detailed information. I took one look at the condition of the tracks & my heart sank. I've seen this stuff on and off for years, never tried it... until now. Just ordered the tube from Amazon. I had tried metal polish years ago bit found it was very easy to get on to ballast... and near impossible to get out. Good reminder Jeff, thanks! Fortunately mine is not installed yet & I wasn't going to until I knew I could clean it. Tried Brasso on one short section & it looks good, but like you say, it will corrode quickly again. These track pieces were ridden hard so corrosion isn't the only issue. Thanks for solving this problem. Have ordered a tube from Anazon. I use the Pico Rail Cleaning stone. It’s an abrasive stone but does not sand down the rail like grit paper does. This is probably not going to be a popular opinion, but my take is....why? Building a model railroad is a lot of work...a daunting task. Getting one that runs well is even harder. And that is when the track is in good condition. Why sabotage yourself from the git-go with used track that is most likely going to be problematic from the start? In addition to the rail problems, you are likely to have plastic ties that have achieved some level of brittle, which can lead to gauge issues, popped rails, etc. I understand being frugal, but to me the microscopic room for error we have in Z means you want to have the best possible "infrastructure" in place. Just my two cents. And no, I don't own stock in any model railroad track companies. I'm afraid I have to agree with Doug. But something to consider is whether the track is worth cleaning. Take a good look at the rails under magnification. Is it just dirt and corrosion? Or has the railhead deteriorated? If the rail is pitted and cratered like this, no amount of cleaning is going to fix it and it's not going to make good electrical contact. The track can still be used on a siding for unpowered rolling stock, but not on the main line. The one piece of curved track I cleaned looks good under magnification. Ofcourse as someone pointed out, just as soon as I cleaned it, it has begun to oxidize again. I don't plan on cleaning any more until the ox no arrives. The ties do not appear to be brittle. I had planned to clean the track & then build a test loop to evaluate electrical contact. Now Im not sure this is a wise thing. Using a few sections as Spurs may be their fate. Lesson learned. Nickle Silver track is Copper+Nickel, roughly 65% copper and 15% nickel. The nickel sorta reduces the oxidation of the copper. There is no Silver (that would really let it oxidize). Zinc is used instead and gives it that sort silver look. True, as soon as you abrade the oxidize surface off, it *atomically* begins to oxidize but all is not lost. Most anything wiped on the rail would conceivable mask the surface but not so. The Wahl Clipper Oil has a great reputation as does the No-Ox. They are effectively a lubricant to it must be wiped off to assure that you don't loose any traction. As stated in the instructions, a *thin* film wiped on the rail, left for 24 hrs, and then wiped off. After the track is cleaned (2000 Nail Polisher for me, 1 time a year, I use T-shirt cotton strips attached to a block on a stick (think Woodland Scenics with the flat piece). I touch my finger tip to the No-Ox surface (a light touch), then tap all over the T-shirt cloth, then rub it all over the T-shirt do there is a minimal film. Tap the rail every foot or so, then go over it all, wiping back and forth. I can do about 10' this way. Then another tap-touch of the No-Ox and more track. Leave it on overnight. Next day, just new T-shirt strips on the block and wipe all the track to remove the excess No-Ox. Change the T-shirt once in a while. After that, whenever we set up for a show, we vacuum that track, then wipe with 70% isopropyl alcohol using the T-shirt strips. Trains run with any issues all over the layout, without any abrasive cleaning! Every show, several times a year. If we find a stubborn spot, we look at it first, then use an erasive block and mark the location with a pin to No-Ox it after the show day. 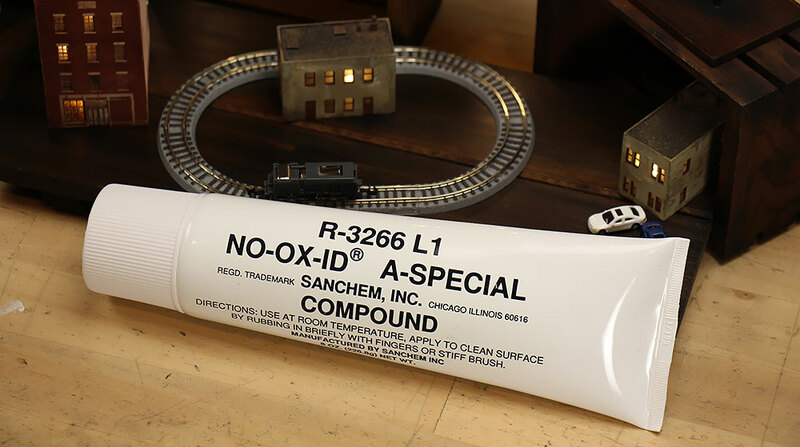 The next show day, we dry wipe the track of carbon (from DCC micro-arcs, trace loco lubricant and traction tire residue). No plastic wheels are used. We always get more dark stuff off of the outer track where we run several very long freight trains which cause quite a bit of wheel slippage. The inside tracks runs typical passenger trains so less slippage although there are more locos. Just got my NO-OX delivered, in the middle of a mini-snow storm up here in NY no less. My only gripe... will I have enough to treat this loop of Shorty track? John, yeah I just got mine too. HUGE ! I don't know how the order page made it look so small !!! I'd give it out free but it's $1+ for bulk glass bottles (like your airbrush paint jars) and $5 for the Priority box !!! Its enough though to rebuild the rear differential and repack all my wheel bearings !! !